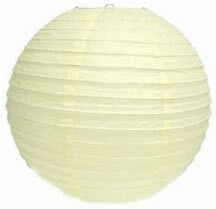 A chinese lantern is a paper ball (or cylinder, cube, etc) with a light bulb in the middle. They are very cheap to buy and use a standard household light bulb. For video and photographic work, chinese lanterns are obviously limited by the small amount of wattage. However they do create a nice light that can be useful for close-up shots. In a wider setting, multiple lanterns can be used for effect. Being made of paper, chinese lanterns are potentially dangerous. They can catch fire so be careful. For storage they can be collapsed to a disk the same diameter as the expanded sphere.